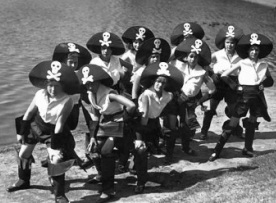 Thanks to the residents who indicated interest and submitted registration forms for Sale-O-Rama. However, there were not enough participants to make it a neighborhood sale. Each year East Harriet has sponsored a neighborhood garage sale on the 3rd Saturday of May, however, there has been a lack of participation the last few years. We are reviewing whether to change the sale to a different weekend or discontinue the sale all together. The new proposed date is the first Saturday in June which is June 2 this year. If you are interested in participating or would like to see Sale-O-Rama continue, would you provide feedback in the following short 3 question survey? Based on the number of responses, we will decide on whether to hold the sale this year. East Harriet Farmstead Neighborhood Association (EHFNA) board had a continuous line of area residents lined up at our tent on Sunday June 23 to get their free hotdog and lemonade. Board members chatted with neighbors while serving up almost 500 hotdogs and 20 gallons of lemonade! EHFNA has Open Streets on Lyndale. East Harriet Farmstead Neighborhood and Preserve Minneapolis will be co-hosting East Harriet Parks and Residences Walking Tour guided by Peter Sussman. Col. Wm. S. King envisioned his 1870's countryside estate, Lyndale Farm, as one day being transformed into a public park and unrivaled residential setting at Lake Harriet. On this tour you will visit Lyndale Park and adjoining residences extending east from Lake Harriet, which were finally realized in the early 1900's just beyond King's lifetime. More details on the history of the area can be found here. Tickets are available through the Preserve Minneapolis website. Starting place will be at the intersection of Fremont Ave S and W 42nd St. Estimated walking distance is 1.5 miles. Wear comfortable shoes appropriate to walk across grass. Some unpaved routes and slopes within the park would be difficult for unassisted or motorized wheelchairs. How to organize information using an Emergency Record Guide; free guides will be available that include a checklist of things to do, memorial instructions, living will and more. 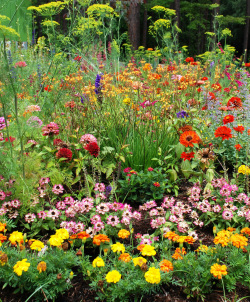 Have you walked past beautiful gardens in your neighborhood and wanted a closer look. Join us for the EHFNA & CARAG Garden Tour and your favorite garden just might be on our route. If not, tell us which one you'd like to see and maybe we can arrange for it in an upcoming year. Garden owners will be on hand to show you around and tell you the story of their garden. Saturday, June 18 - Meet at 10 am at Dunn Bros Coffee on 34th & Hennepin. Monday, June 20 - Meet at 6:30 pm at the Men's Garden located at the corner of King's Highway and Roseway. Wednesday June 22 - Meet at 6:30 pm at Bull Run Coffee on 34th & Lyndale Ave S.
Interested residents will meet up at the designated locations and walk as a group from garden to garden. Maps will be provided. Join us for one, two or all three days of garden fun. Meet new neighbors while touring several different gardens each night. Contact Linda Bormann at 612.208.9318 if you have questions or would like more information. East Harriet's Sale-O-Rama is scheduled this Saturday, May 18 from 9 am -3 pm. Shopper turnout should be good with warmer temps expected. Maps can be picked up at each sale location, Lyndale Farmstead Park and at Guse Green Grocer or click here to view and print your map. If you are looking for a way to give back during this holiday season, we have a great idea for you right in our neighborhood! It is Walker Methodist "Give a Little Gift program"! Through this program we ensure that each and every one of the residents at Walker Methodist Health Center will receive a personalized gift during the month of December. Stop in and pick up a flyer or call Cathy at 612-827-8342 for more information. Volunteers of America - MN's Southwest Senior Center and Kingfield Neighborhood Association are working together to create a new community mosaic for Rev. Dr. Martin Luther King, Jr, Park. Volunteers are needed to construct mosaic during our indoor workshop. People of all ages are welcom to attend, but children under the age of 14 should be accompanied by an adult.. If interested contact Mary Ann Schoenberger (612) 822-3194 or mschoenberger@voamn.org. Spring will soon be here and that means it's time to clean out your closets, basement and garage! 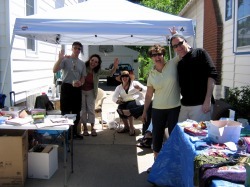 Join us for the East Harriet Sale-O-Rama, our annual neighborhood garage and yard sale. This year we’re hoping to make this event the biggest, most successful Sale-O-Rama ever! And don’t forget – you’ll end up with clean closets, make some money and have FUN! INTERESTED IN PARTICIPATING? SIGNING UP IS EASY! 1) Email (info@eastharriet.org) or call (612-824-9350) to let us know you’re interested. Be sure to include your name, mailing address, phone number and email address. 2) Or you can simply print out the Sale-O-Rama registration form here. • Key items you’re selling (i.e., kids clothes, collectibles, books, queen size bed). This will be listed next to your address on the flyers. Note: Registrations received after Wednesday, May 11th will not be included in the ad. • Advertising! Your address will be listed in our Garage Sale Ad in the StarTribune newspaper & website, Craigstlist, Facebook! • Sale-O-Rama Flyers! A neighborhood map with all the participating households and key items will be listed. Each sale address will get a supply of the flyers to hand out. • Clean closets. Make money. And have fun! Don’t forget! The deadline to submit your registration and check for $10 is no later than Wednesday, May 11th. Questions? Contact Deb Schirber, info@eastharriet.org, 612-824-9350. 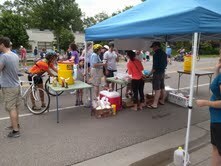 Despite the threatening clouds, bikers and walkers filled Lyndale Ave for 20 blocks on Sunday, June 12 from 10m to 2pm. Minneapolis is already asking, "when is the next event?" Lyndale Ave was blocked off from 22nd to 42nd Streets for people to run, bike, skate or walk for the first annual Open Streets Event or also referred to as ciclovia which translates to "bike path" in Spanish. This free, fun, family and pet friendly event allowed people young and old to take to the streets while engaging with other residents and businesses. On the corner of 41st Street, East Harriet Farmstead Neighborhood Association's Community Building Committee provided supplies for kids to decorate their bikes. This was followed by a bike parade and a blessing of the bikes ceremony performed by Rev Beth Warpmaeker of Bethlehem Lutheran Church. The kids dismounted their bikes long enough to create chalk art in the streets and have their face painted while enjoying some refreshments. This turned out to be a fun event for all. Other highlights along the route included a train of interconnected recumbent trikes, a full musical ban on a bike and a few hundred people doing yoga! A big thank you to the Minneapolis Bicycle Coalition for organizing this big event and making it happen! To view more photos, highlights and comments, visit the Open Streets website and facebook. Open Streets Ciclovia is back on June 10 for 2012! Lyndale Ave will be open from 22nd St to 42nd St from 10 am to 4 pm for residents to walk, run, bike and skate. There will also be programmed recreational activities along the streets including yoga, dancing, games, musical performances and classes on bike safety and repair. Click on Open Streets Minneapolis website and watch the video of last year's event to witness how much fun was had! Visit East Harriet at Open Streets 2012! East Harriet Farmstead Neighborhood Association (EHFNA) invites you to stop at our tent that will be set up in the parking lot of Parent's Auto at the corner of 36th & Lyndale. East Harriet sponsored events include bike decorating and a lemonade stand from 10-2. Free Hotdogs will be served beginning at noon to 2 pm or until we run out. Lake Harriet Veterniary is sponsoring their third Red Cross Blooddrive this Saturday, December 3 from 10 am to 3 pm. The Bloodmoble will be parked outside the clinic, 4249 Byrant Ave S. All are welcome! You can schedule a time slot by going to www.redcrossblood.org or come without an appointment and wait for the next opening. Take a break from christmas shopping in Southwest Minneapolis. Donors will get to enjoy treats from Patisserie 46 after they donate. This event will occur Monday, October 24, 2011, 7:00 - 8:30 pm at the Theodore Wirth House, 3954 Bryant Ave S.
Using Michele Norris' book as a springboard, we will explore the themes of inclusion and exclusion: What events in the book resonate with our own experience? What is it like growing up as the Other? What does tolerance mean in a supposed post-racial age? Does the cost of secrecy sometimes outweigh the gift of silence? Does the author offer any insights into our silence around issues of race and ethnicity? To assist in the discussion we will be joined by Whitney Harris, Executive Director, Diversity and Multiculturalism, Minnesota State Colleges and Universities. Reservations are required. Please RSVP to Donovan Hart at jdonovanhart@gmail.com. The book, "The Grace of Silence" by Minneapolis native and National Public Radio host, Michele Norris, was chosen for One Minneapolis, One Read. Her memoir describes the experiences of the Norris family as the first black family on their block in a south Minneapolis neighborhood. MPR News host Kerri Miller and Michele Norris will be discussing "The Grace of Silence" on Monday, October 3 at 7 pm at the Guthrie Theater. A dessert reception will follow. Tickets are on Sale now for $10 general admission and $5 for seniors, students and limited income. Tickets can be purchased at the Guthrie Theater's webpage or call 612.377.2224. For more information on additional events, go to One Minneapolis, One Read webpage. Did you know that Col. Wm. S. King envisioned that his 1870's countryside estate, Lyndale Farm, would one day be transformed into a public park and an unrivaled residential setting at Lake Harriet. On this tour you will visit Lyndale Park and the adjoining section of stately residences just east of Lake Harriet - developments which were finally realized in the early 1900's. Today Lyndale Park today features iconic gardens but from 1918 it was the setting of children's pageants attracting crowds of 10,000 spectators. Nearby Fremont Avenue and East Harriet Boulevard appear a world apart, representing to this day some of the most gracious blocks of residences in Minneapolis. The Walking Tours are co-sponsored by the Linden Hills History Study Group and the East Harriet Farmstead Neighborhood Association. Starting this summer, Preserve Minneapolis, a non-profit, volunteer organization of historic preservationists, has assumed responsibilities from the City of Minneapolis for the Minneapolis Walking Tours. Fees will be reinvested to fund the ongoing tour program. Open Streets events, based on the Ciclovia that started in Bogota, Columbia, are becoming popular in many cities in the United States. The event allows bicyclists, pedestrians, skaters and wheelchair users to take over miles of streets to explore and enjoy their neighborhoods. This event brings families and neighbors together to mingle, recreate and shop in a safe car free environment. Minneapolis is planning their first Open Streets event to take place on Sunday, June 12. The proposed route is Lyndale Ave from Franklin Ave to 42nd St. Follow the progress of this event at Open Streets blog. Lake Harriet Veterinary is sponsoring another Red Cross Blood Drive on Saturday, June 18 from 10 am to 3 pm. The blood drive in January was highly successful and the neighborhood participation was outstanding, and the Red Cross has requested to come back and do another blood drive. Interested donors can sign up at www.redcrossblood.org. Use sponsor code # 7444. Lake Harriet Veterinary would like to thank everyone who can make it again! Round up your East Harriet neighbors and sign up for the first annual southwest neighborhoods adult co-rec dodgeball invitational. The tournament takes place on Saturday, May 14th beginning at 9:30 am at Martin Luther King Park, 4055 Nicollet Ave S.
A traveling neighborhood trophy will be presented to the winning team and a bowling party compliments of Bryant Bowl. Click here to view and print a registration form. Deadline to register is May 6th. For more information, contact Carmen Wilson at 612.290.8107. Acclaimed photographer Elliot Erwitt's images of pooches and celebrities from around the world have come to East Harriet. Three dozen photographs from his 60 year career can be seen at the Weinstein Gallery, 908 W. 46th Street, until January 9th, 2011. Read more about Mr. Erwitt's work, recently featured in the Star Tribune article, "Dogs and Other Celebrities". Lake Harriet Veterinary, 4249 Bryant Ave S. is sponsoring a blood drive on Saturday, Feb. 19 from 10 am - 3 pm. The Red Cross trailer will be parked out in front of the clinic and refreshments will be served inside the clinic courtesy of Patisserie 46. There will be 30 available slots throughout the day. Please call 612.822.1545 to reserve a time or for more information. Mark your calendar for the Minneapolis Bike Tour scheduled for September 19. Pre-registration will now through September 15. This scenic long course showcases several Minneapolis lakes and travels along the Minnehaha Creek and the Mississippi River. More than 25 homes participated in the 2009 Neighborhood Sale-O-Rama. The neighborhood was bustling with shoppers out to find a good deal. Click on the photo above to view some of the offerings that day. Thanks to all who participated!